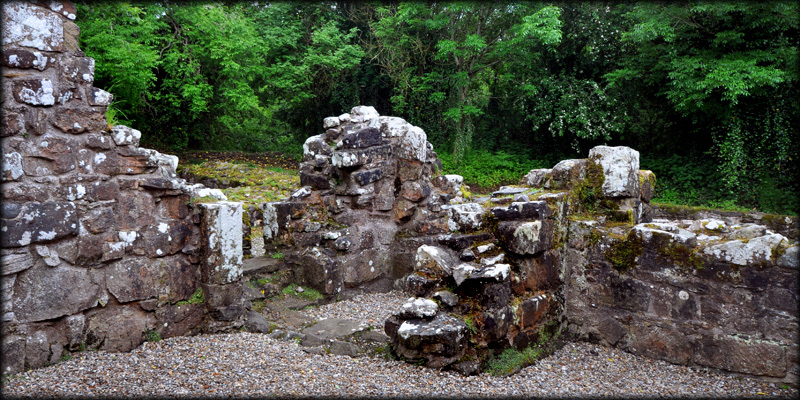 Situated in the southwest corner of the nave at Dungiven Priory are the remains of an engaged round tower. All we see today is a metre-high 2x2 metre-square base with openings on three sides. This 12th century tower would have been similar to the engaged tower at Ferns, County Wexford in that it had a round drum sitting on a rectangular base. To see an early nineteenth century drawing of the pillar stone at Dungiven with the church complete with round tower, in the background click here. 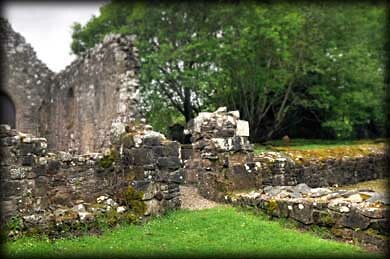 Situated: If you enter Dungiven from the A6 (South) take the first left sign-posted Dungiven Priory. Park here and walk down to the Priory. The base of the tower is located in the southwest corner of the nave. Discoverer Map 7: C 6913 0827. Last visit June 2013.